Theres not much to a wrap bar, so you can fabricate one or buy one. Do yourself a favor and modify your exhuast to put the wrap bar on the passenger side. Preferably as close to the pumpkin as possible. When you accelerate the vehicle will try and squat the right rear corner, with the wrap bar on the passenger side it will conteract this motion. As the right rear tries to squat the wrap bar will be trying to lift the vehicle, giving you a nice level take off. 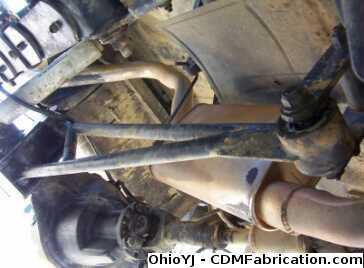 Putting the wrap bar on the driveside will greatly amplify the squatting of the right rear, and quickly sag springs. 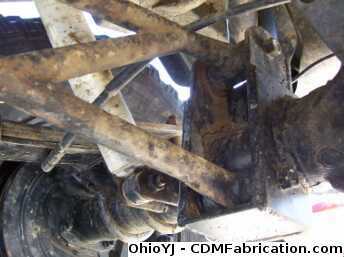 Driverside wrap bars also introduce torque steer. Torque steer happens when you get on or off the gas, the Jeep will want to go left or right. Just put the wrap bar on the passenger side. Here is a side shot of my wrap bar. 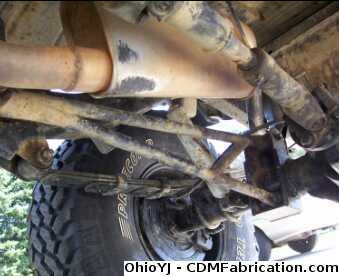 Because the axle will actually move foward and back as the suspension travels, the wrap bar must be mounted to a shackle, just like a leaf spring. My wrap bar has a johnny joint at the bottom of the shackle to prevent binding during articulation. As the passenger side travels up or down, the bar will have to rotate slightly, the johnny joint allows it to do so, without bind. As for attaching the wrap bar to the axle, its just a boxed mount welded directly to the axle tube, as close as possible to the pumpkin. 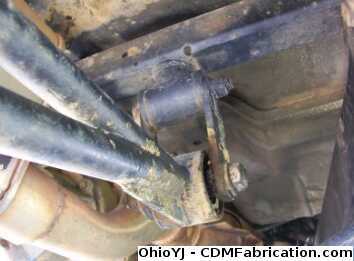 Most people just bolt a bracket onto the skid plate to attach the shackle, like shown in the picture. My warp bar actually pushes on the shackle. There is a 2x2" piece of square tube that I ran from one side of the frame to the other, then its mounted to that. Not the traditional method, but push or pull both function the same.